It’s December! I’m aboard the holiday train and it has pulled out of the station. There’s no stopping this train now; I’m watching holiday movies, listening to holiday music, eating holiday treats, etc. It was only a matter of time before my clothes started to reflect my inner holiday spirit. ABC Family started their countdown last week; it’s basically a holiday party every day. Anyway, when I found these hunter green (or should I say ‘huntress green?’) pants at Loft for, get ready, $2.50, I knew I was going to pair them with red and gold glitter everything! My tea/coffee print top morphed into a “hot cocoa” print top; my red plaid flats became red flannel print; my huntress green pants were dubbed evergreen holiday pants. I meant it when I said the holiday train is on the tracks and headed for the North Pole. You know I love a good fashion theme (and metaphor), and I’m definitely going to take this theme WAY too far this season. It’s a terrific two (dollar) and holiday train ensemble, and though you can’t hear it, you can bet I was humming holiday songs while taking the photos, writing the post, and posting. 1) One of the questions I am frequently asked is about how to make shoes last. As a commuter, I always have a pair of dress shoes in my bag and ‘commuting’ shoes on my feet when I’m headed to and from work, especially this time of year. Nice shoes really don’t go well with snow, salt, and sand, which is generally all over the streets and sidewalks in Chicago in winter. I do think that shoes should be worn, don’t get me wrong, but I like to preserve mine as long as possible by leaving the snow, sand, and salt to my winter boots. Using this tactic, the plaid shoes pictured here have remained in great shape over the years. 2) Cyber Monday is still happening on many sites for a few more hours, if you want to sneak in a few more deals! I found that Loft, Gap, Banana Republic and Old Navy all had great sales in their stores, and great online sales are ongoing until tomorrow. My Black Friday post is coming tomorrow! What a whirlwind! Did anyone find anything good?! Sorry for the delay in posting last week- the holiday got me a bit off track, but I am catching up on all of your posts (and mine)! Thank you so much for visiting! How cute!! Nothing wrong with having Chrismast spirit all over…or overboard. I just got me a pair of green booties myself! You look adorable by the way. Hi Melissa! How have you been? It’s difficult to believe 2.50 for pants? I want to live in USA, we don’t have such price at all nowhere. Did you buy it from Ann Taylor online store? $2.50!!! That is crazy!! I love those pants – what an awesome deal! 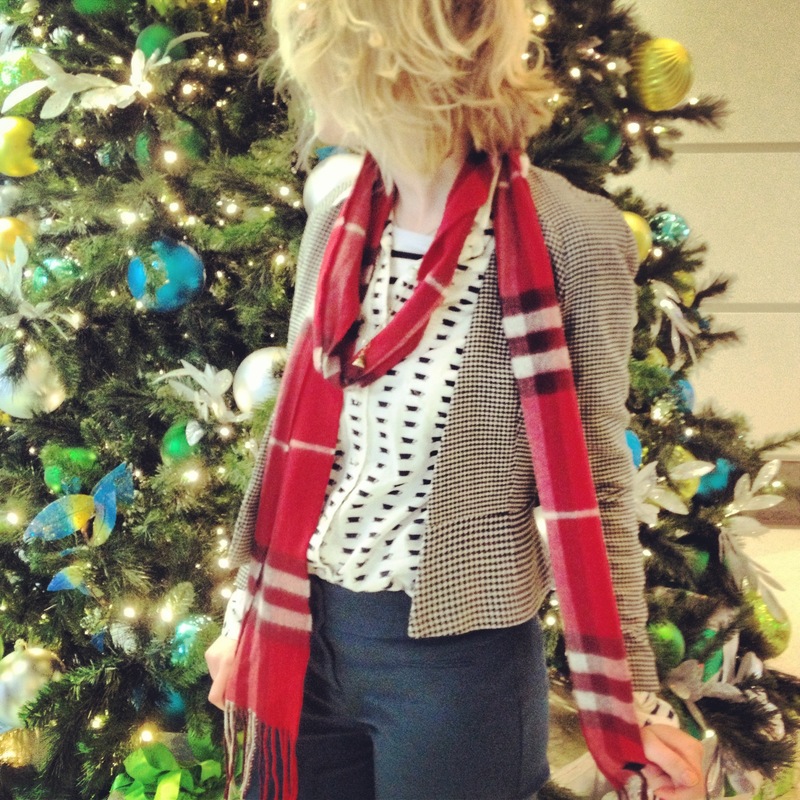 Loving your entire holiday inspired look – especially the shoes! So cute! beautiful outfits, pretty backdrops and lovely you! $2.50 – how is that even possible?! These pants look great. I got some good J.Crew deals during Cyber Monday, but nothing that good! I found a $250 necklace that I had been eyeing for $12.50… I was proud haha but I think these pants beat it! 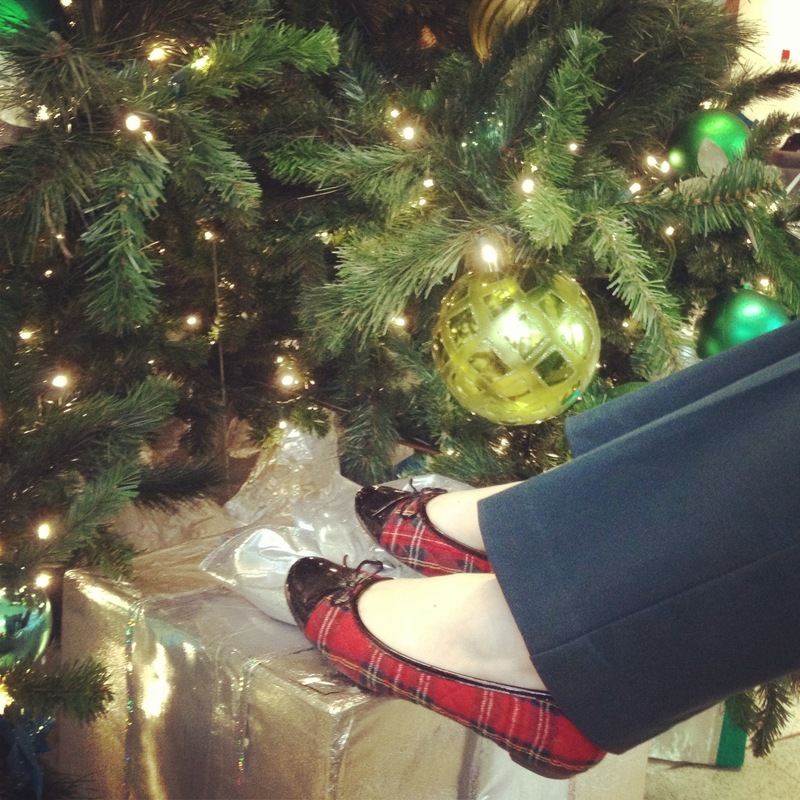 This is such a cute shoot with the tree and those plaid flats are too perfect for the season! Ummm… $2.50?!?!? That just does. not. compute. Seriously, I NEED your deal-finding ways! 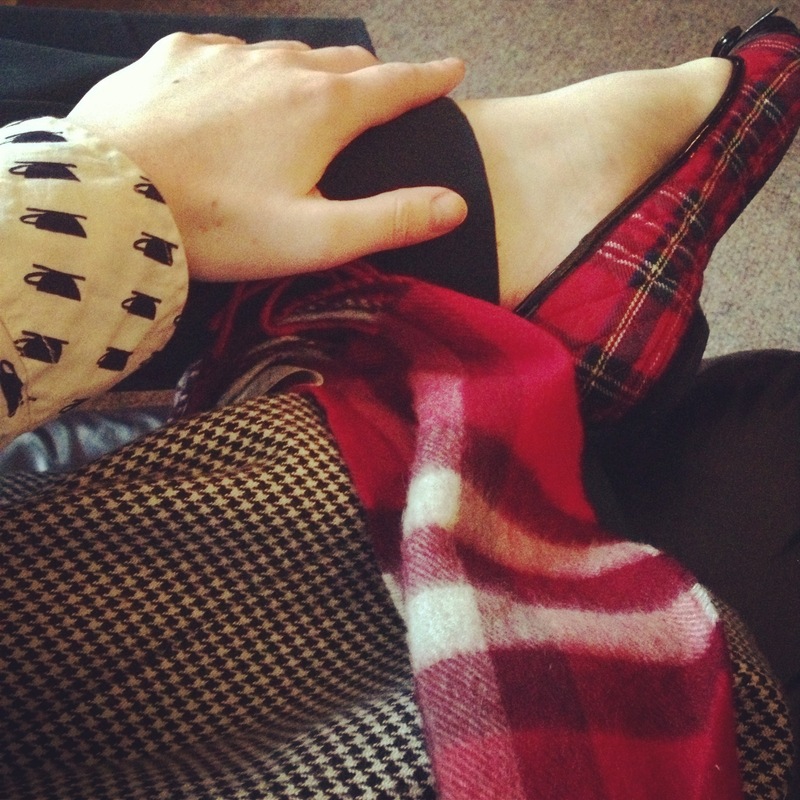 Also, after being big anti-scarf for like, ever, I caved and bought a few this fall… And now I can’t stop wearing them! Haha so I’m totally glad to see that you wear yours inside too and I’m not just a completely unfashionable crazy person. I love Ann Taylor’s sale section..there’s always a good deal to be found. Love the shoes and scarf. so, this is one of my favorite looks so far…could be I’m right on that holiday train with you!